Judgment is rapid, and sometimes what really matters is agreeing with people around us. We all can think all we like, but we can't think for other people. Community is a strange place, a set of very interesting and great people and even more amazing ideas and principles. And that set especially who have always had an opinion about what we do and what we don’t. We might have often wondered if people would stop talking, judging and leave us alone to live happily our own lives. We have also been very curious about the interest about the lives of others. Is it a way to help people improve their bad conditions? Is it to be great for them? NO. It is to show the concern and tell us how important we are to them. It is to make mockery of us so that they feel good about themselves. And so many other questions that come to us several times. But is it really that is needful? Each person is probably trying to sort out their own challenges in their very ways. Perhaps the best thing we can do is smile and offer help if we can. If not, we can just maintain distance and still try to smile about it. Why is the need to label it as either good or bad? Why we need to pop up in other shoes? Mind your own work and life. Live the happy life and let others live. Make a difference. Stay motivated. 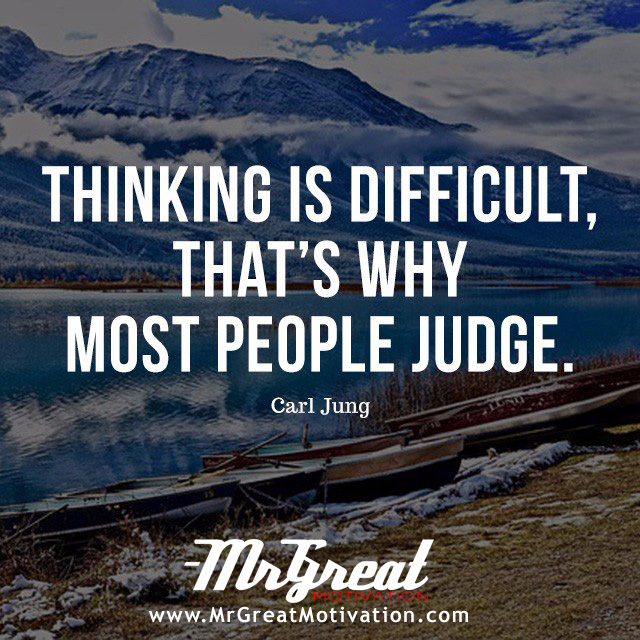 We hope guys you find Quote "Thinking is difficult, that’s why most people judge.-- Carl Jung " by Mr Great Motivations useful. If you think we have made some efforts, then don't forgot to appreciate us by sharing this Quote with your friends and family, And thanks for visiting.